Designed specifically for citrus juicing, the Epica Powerful Stainless Steel Juicer pairs a futuristic appearance with basic, nearly silent, function. Before we continue, I want to make sure you realize now, before we go much further, that this is a citrus juicer. It is not intended to juice apple, pineapples, carrots, or any other type of non-citrus food. If you are looking for a juicer which can handle those tasks, head over to the centrifugal and masticating juicer reviews. 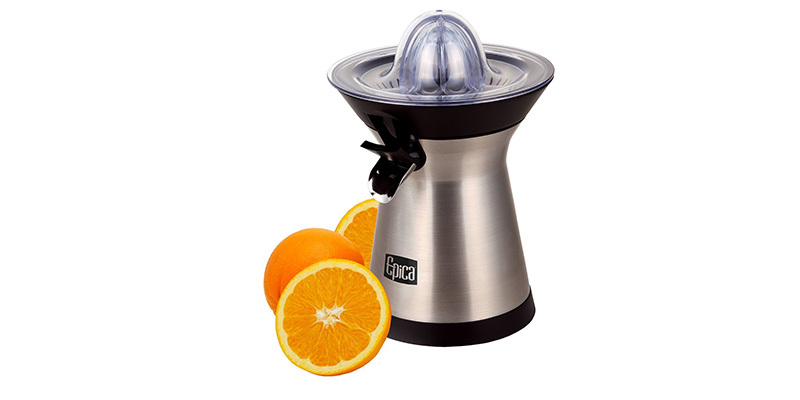 In this article, I will review some of the basic specifications of this Epica citrus juicer, as well as some of its special features. 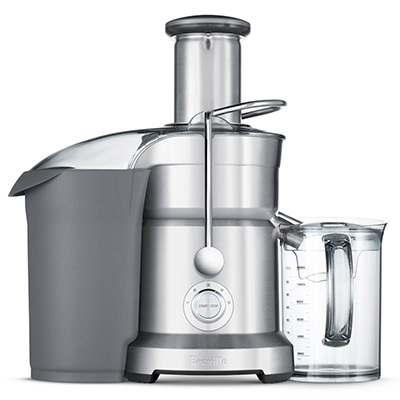 My major focus will be on helping you decide whether or not this juicer would make a good addition to your kitchen, by critiquing those specifications and features and adding to it my research on consumer experiences. As I have already explained, this Epica juicer is clearly built for juicing citrus. Where masticating and centrifugal juicers feature feeding tubes the Epica features a citrus reamer. The citrus reamer atop this juicer makes extracting the juices of any citrus fruit fast, simple, and painless. No need to struggle with manual reamers or presses which place strain on your hands, wrists, and arms. Simply place your halved fruit cut-side down on the reamer, pull the lid down, and watch the juicer do the rest. This juicer comes with two reamers (one large and one small), making it perfect for extracting the delectable flavors of any-sized citrus fruit. Easily and effortlessly remove the juices from a large grapefruit. Extract flavors from tiny limes without losing your grip. Unfortunately, since this juicer operates only by squeezing down on round, soft fruits, it is unable to do many of the things you may have come to expect from a centrifugal or masticating juicer. It cannot process and extract juices from hard vegetables or fruits, or from leafy greens. Its design will not even allow it to extract juices from other soft foods, such as bananas. One look at the Epica Juicer and my first instinct was to run and hide from approaching alien species. The mixture of stainless steel, black plastic, intense hour glass shape, and clear domed lid are strangely reminiscent of a space craft. These days, it appears that electronic devices are starting to do more and more. The usefulness of a small appliance is often defined by its number of functions. The more modern and futuristic an electronic device or appliance appears to be, the more one expects it to have multiple functions and features. Despite its very futuristic appearance, there really isn’t much to this juicer. It effectively performs its basic function of extracting juice from citrus fruits, but does little else. This specialized function may seem like a waste to those who want save counter space by purchasing all-in-one gadgets and appliances. 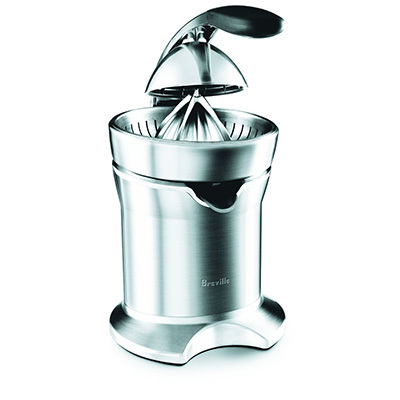 However, it is this specialized function which allows the Epica Citrus Juicer to operate at such a low noise level. Extracting the juices from citrus fruits is rather easy, meaning that it does not require fast-moving parts or a loud motor like many other juicers. Although I did not mention this in the introductory paragraph, I do believe that it is important for potential consumers to know that this particular juicer is much more environmentally-friendly than many other juicers on today’s market. 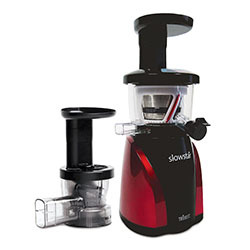 The small 70-watt motor included in this juicer draws much less power than large centrifugal juicers with motors ranging from 600 to 1000 watts. Large motors are important in centrifugal juicers, as they are necessary for processing hard foods. That degree of power is not necessary when juicing citrus fruits – using a heavy-duty centrifugal juicer for this purpose would place unnecessary demands on the environment. When performing research for these juicer reviews, I gathered information about consumer experiences by reading hundreds of reviews written by those who have actually purchased and used the products. Consumer reviews about the Epica Citrus Juicer were, for the most part, quite positive. Of the few negative reviews I was able to find, most centered on a single issue – the juice spout. Apparently, the adjustable juice spout has been known to break off completely as people try to adjust it from pointing in one direction to pointing in another. It may not appear to be that large of an issue, but the reality is that if this piece breaks the entire juicer becomes useless. 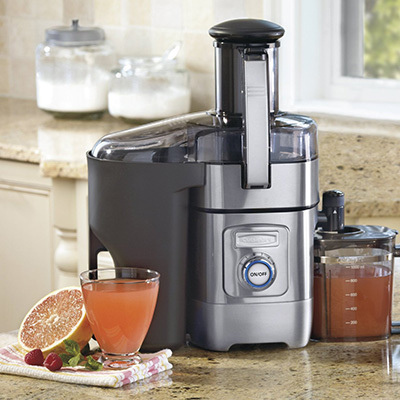 Without the juice spout, juices flow directly into the bottom portion of the juicer itself, never reaching your glass and possibly damaging the machine’s motor. 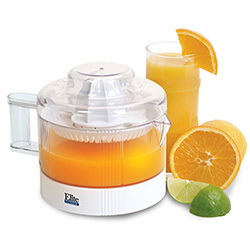 The Epica Citrus Juicer is perfect for creating fresh, crisp juices and flavored waters. It will make a great addition to any lemonade stand and can create excellent cocktails for your next backyard barbecue extravaganza. It takes the difficulty out of juicing these succulent fruits and is especially helpful to those with arthritis and carpal tunnel syndrome. If you are in search of a juicer which can perform multiple tasks or juice many different kinds of fruits and vegetables, this is not the juicer for you. 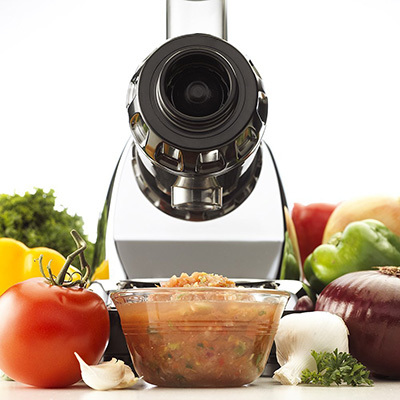 You will need to look for a centrifugal or masticating juicer to meet those needs. However, if this is not the case, why spend extra money for a machine with extra features you do not plan to use? 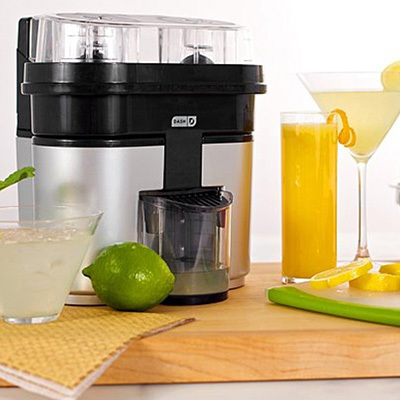 If you are only looking to create citrus juices, however, this low-cost juicer will do just what you need it to do. I do have concerns about how easily the juice spouts appear to break. Weighing that against how helpful this machine can be and its smaller impact on the environment makes it difficult to decide if I would feel right in recommending this product for anyone reading this review. I would cautiously say that this may be a great purchase. If you do decide to purchase this juicer, work carefully with the juice spout and check into warranty information before purchasing.